Ethics 4 A Digital World: Is it YOURS to Share? Is it YOURS to Share? 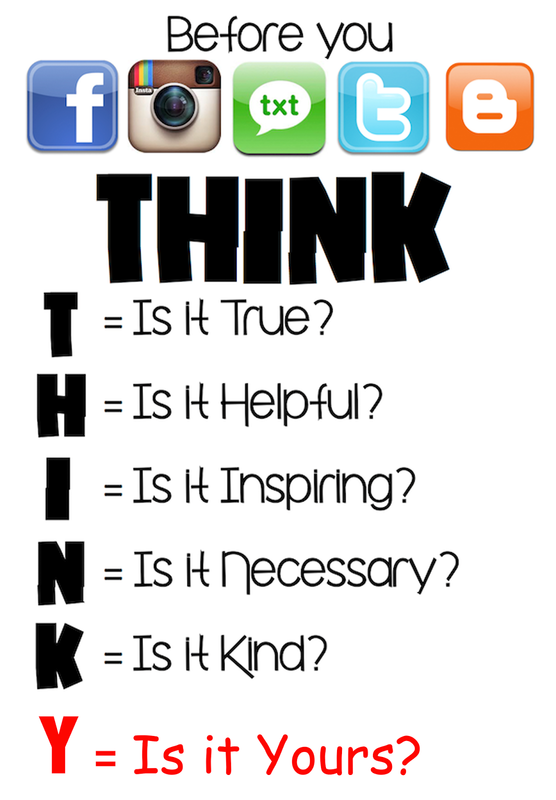 I'm constantly looking for ways to reinforce the concepts of Digital Citizenship in ways that my students can remember. A lot of that has to do with repeating myself over and over and over...and over. Twice. So some things have happened to make us revisit the concept of thinking before you (fill in the blank) when online. In the modern age of sharing, sharing, and sharing some more, we thought something was missing here. Something to do with consent, positive digital footprints, and being a good friend. We were asking ourselves quite often, "is this mine to share?" Is it my story to tell? Do I have permission to show others this photo? Wouldn't I appreciate being asked first before someone shares a picture of me? With that in mind, we decided to add a Y to our think posters. After all, this is an essential question to ask before we post anything, every bit as important as truth and kindness. Pass it on. Make it happen.